Ladies and gentlemen, it’s time to lose the George Costanza wallet. You know, the one that acts as your junk drawer and has swelled to the size of carry-on luggage thanks to too many credit cards, old receipts and expired coupons. 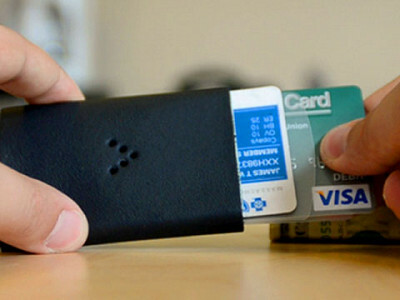 Zeroz has the perfect replacement: a minimalist wallet that’s slim, stylish and super efficient. Designer Paul Westrick came up with the idea for these sleek card- and cash-carriers after a four-day bike ride. He had ditched his fat wallet for the ride and took only the bare essentials -- cash and credit cards -- held together with a rubber band. After the ride, he started working on a refined version of his liberating rubber-band solution. Today Paul’s zeroz wallets are made in Ohio with leather from Italy. They’re designed to hold just the important stuff: Your ID, debit card, credit card and maybe a photo or two of someone special. A cashStrap keeps bills or a single key secure. Three sizes are available. The extra-small size holds 2-4 cards, the small version holds 5-6 cards, and the large option holds 10 cards. Are you ready to lose the bulk and get slim with zeroz? Hi. It's Paul, the designer of zerOz. I am passionate about super slim wallets. We just don't need fat wallets anymore! I've created something for bag or backpack, front pocket or purse in a range of different styles to match how we live ... perfect for a night out or a long bike ride...all super skinny ... all super stylish. i got one thinking i would use it on specific occasions...turns out, i use it all the time! Are these all the same size? @Gwen: They vary in depth and can hold a different number of cards. The x-small holds 3, the small holds 5 and the medium holds 10. I liked the red and the 3-card, but I really wanted a cash-strap, so while I did errands downtown, Paul designed a custom model for me. It was ready by the time I was. I have been so happy with my Zeroz! I used to carry a 'pocketbook'-style wallet, but no one uses checks anymore, and, as implied in the video, you really DON'T need that much when you are out and about. The 3-card is perfect for my minimalist lifestyle. ID, money card, and health card. I keep my store reward cards in my reusable shopping bags, and the rest are not daily essentials. As we strive as a society to reduce our waste and dependency on nonrenewable resources, I believe that Zeroz is on the right track. I now have let this minimalist approach steep itself in everything else that I do. @Melissa: Wow! We are so glad that you stopped by with your story. It's important to us and our visitors to be doing business with people we trust, who have a passion, and a strong customer connection. Your first hand encounter helps us to know Paul and his work even better. Just to clarify for any visitors, the three card (X-Small) version we are carrying today does have a cash strap. Very beautiful indeed but.......your cash is outside the wallet where it can easily fall or be pulled out! Not good! Especially not good - in fact I don't think you could even use this - if you were carrying a lot of cash (like you pretty much don't use cards). Got a solution for that? @Pamela: hi .... so many people are not using cash so we wanted a super easy way to use cash just like a money clip but without the fat and bulk. it really does sit in there really nice ... if you're lucky to have cash stuff it big...works awesome. it also holds hotel room keys...you can even slip the cash under the outside card. thanks for asking! @Paul Westrick: I also have a zer0z, and have used the tab to hold a $20 bill inside with my cards. That works as my emergency cash...because I would rather use my debit card for everything. @Paul Westrick: thanx! Farmer's markets and the like are cash only around here (central FL)! OK, this looks great, but I have the classic George Costanza wallet. Am I trainable? Do you find people like me hard to "fit" with your wallet? Garry! great question. trainable.....oh yeah .... you like many guys have accumulated too much stuff. me too. when you really look at what you use....it's really just a few cards. or just get an xs and use it for a great night out....a cool concert or travel on the metro! you'll be super happy...happy enough to levitate. Are these wallets RFID-blocking? If not, are you considering an RFID- blocking version? @Paul Westrick: If you keep innovating, we'll keep sharing your products! @Paul Westrick: I'd probably have to get a "going-out" version when you offer a metal version, sounds cool!! I have a red ZerOz and I love it. I used to carry around a fat wallet and now I wonder WHY?! My friends all comment about how unique it is and always ask where I got it. The best part I like about it is that it fits in my front pocket or slips in my jacket. Also stacks nicely on your phone when you just want to sit your stuff on the table at a restaurant/bar. If you're in Cbus stop by the store for extra personal attention! I am wondering, with the 10 card wallet can you safely put 5 cards and they not fall out? Where is your shop in Columbus? I bought one for my fat-walleted husband for Xmas. He isn't quite ready to give up the George Constanza m.o., so I hijacked his zerOz and I love it. It helped me get my cards organized in my purse and now it's easier than ever to switch purses or go purse-less. WooHoo! Thanks Paul! deb ..... you're not the first to hijack or "borrow" a zerOz. some guys really really really have trouble letting go! security blanket :) who knows..... At zerOz, we have fat leather chairs in our retail space for guys to breathe and relax, recline and ask themselves, as they lean to the left propped up by their George Castanza wallet... and ask the big question in life: "do i need to carry this ridiculous fat clod around in my pocket everyday?" usually it's NO ..... but lucky you. These wallets are the bomb diggity for sure. I have one and want another one already. Slim, functional and they look great too. Great job on these Paul. hey thanks jeffrey. I think women would just not believe that even us guys are actually changing out our wallets per occasion! shhh ... seriously, to go for a nice dinner, a client meeting, drinks, a concert, or sports event, to slim down even further from any wallet...even a medium zerOz....it is a totally pulled together slick feeling to have just what we need and not weigh ourselves down with unwanted wallet stuffings. front pocket for guys...a small clutch for women...we'll match up how you want to live as we strive to go lighter. I am wondering how to contact this company. I would love to find out about carrying these wallets in our store. Is there an email address or phone number you could provide? I'd appreciate it very much. @Barbara: I will contact you directly. another question, What are they made out of?? looks like leather,pig,cow,deer??? @lori: I have sent Paul your question and will let you know. lori .. good question. so obvious and I should have shared more. They are all made from awesome, full grain, leather we bring in from Italy. The black is more matte while the blue gray zerOz has a metallic finish. The white is a super beautiful pearlescent which actually makes it very very durable. The base material that the cashStrap locks into is recycled leather from the shoe industry and formed into sheets and die-cut to our specs. The cashStrap is also super durable and grippy to hold your cash or hotel room key if traveling. Thanks. @Paul Westrick You seem to be out of stock, is there anywhere else I can get two of these as gifts for birthdays???? @ Betty hamer-Hodges: Thank you for your interest. We'll get back to you directly how to order the wallets. Looks good but how about a vegetarian version? @Mike: Great idea! I will pass it along. I was all ready to order one, possibly two, until I learned they are made of leather. How about a non-animal, much kinder (and modern!) material? @Stacey Schwingle: You are on the same page as Mike. I have let Paul know that our community would love to see this available in a non-leather material. @Stacey Schwingle: we should have a cork zerOz by next year :) but the base will still be of recycled leather from the show industry scraps. we use 25% or less leather of a typical leather wallet so we're doing pretty darn good :) we may use a metal aluminium base but these special zerOz will be more expensive. I've been using a "small wallet" similar to this for years. It's made by another company and if it ever wears out, I'll get one of these. I never carry a purse -- makes my shoulders hurt to see women carrying around those huge bags. Instead, I just slip my small wallet in my pocket with the essentials: a fell bills, one or two credit cards, drivers license, metro card. That's it. Everything I need. I was all set to buy this great gift for all the men on my list, until I read the fine print that says you can't ship to Canada. What's with that?? We're just next door. Maybe you could look into revising your policy. @Ruth: Some, but not all, products do ship to Canada. This one DOES ship to Canada. We apologize for the confusion. @Lisa Rich: To find out what the shipping cost will be, put one in your shopping cart and go through the ordering process. You can cancel the order before completing it if you choose to send it to your mom instead. I bought the zeroz wallet and just wanted to thank the inventor who made this incredible item. @Rick Buckley: We're glad that you love your zerOz wallet. I have forwarded your message on to Paul - it will make his day. This thing is awesome. It's going on the Christmas wish list. Jen & Wendy - can I be your friend? None of mine give me gifts with $50 bills attached to them. I bought a green zeroz wallet for my husband and he loves it! However, I wanted to get one for my dad for Christmas---the black one in medium....can I pre-order it? Great product! @Lisa Stevens: Paul is evaluating which colors and styles he will be doing in 2012 and cannot commit at this point to having any specific item available. We're thrilled that your husband loves his zerOz! Looks very nice and functional, though, would prefer a non-leather good. Is that going to be possible ? If yes, will surely wait until that. But all in all, of great utility. @Kal: Thank you for your interest & suggestion. We've passed it on to Paul. @Vicki: Thanks for stopping by to share your concern & "security" idea. We've passed it on to Paul. You seem to be out of stock, is there anywhere else I can get two of these as gifts for birthdays???? Are there any other places I can purchase this Item? When will there be more in stock? I would like to purchase another one. @ Marissa Dominguez: We don't have a committed date; will contact you directly when available. Thank you for your interest. I placed an order Friday 6/15 and have yet to hear of a shipment date. What is the typical turnaround time for this company? For the price, I would have expected some notice to be sent if there was a delay. Frustrated that I also cannot find a phone number for company. @ Jason: Since we have not been offering the wallet before 6/15, you might have bought the wallet somewhere else? Our Customer Support Team will be contacting you directly to help you resolve your frustration. @Chew-Hoong - I appreciate your timely response. I ordered directly from the Zeroz website. I apologize, I did not realize that you sold the product as well. My frustration is not with Daily Grommet, but with the seller directly. I still have not heard back from Zeroz nor have a found a contact number for them. @ Jason: Thanks for letting us know who you bought the wallet from. Hmmm...Paul & his team is usually very good at getting back. If you still don't hear from them, let our Customer Support Team know. Look out for another email from our CST. I was hoping to buy one of these. Are you going to carry them again? @Alice Eichelman: We plan to offer more soon and will email you once they're available. We appreciate your interest. I may be over looking it but, I cannot find a price for the ZerOz. I think that my husband would like one, I am interested too. I just can't seem to locate the price. @ Kim: The Price Range of $26–$34 is on the far right of the video clip. When you click the down arrow of Options, you'll see the price for each wallet. The wallet is currently not available. Please be sure to click "Notify When Back in Stock" button to hear from us when the wallet is back. Thank you for your interest. Where can I find the inner portion that has a tab on it. My husband has worn his out .? Ladies and gentlemen, it’s time to lose the George Costanza wallet. You know, the one that acts as your junk drawer and has swelled to the size of carry-on luggage thanks to too many credit cards, old receipts and expired coupons. 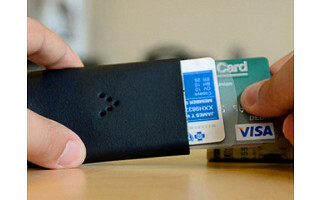 Zeroz has the perfect replacement: a minimalist wallet that’s slim, stylish and super efficient. Designer Paul Westrick came up with the idea for these sleek card- and cash-carriers after a four-day bike ride. He had ditched his fat wallet for the ride and took only the bare essentials -- cash and credit cards -- held together with a rubber band. After the ride, he started working on a refined version of his liberating rubber-band solution.